An ultra-modern museum on the topic of emigration from Germany and Europe to the New World, mainly the USA, but also South America and Australia. It is located in the German harbour city of Bremerhaven, which was THE premier embarkation point for those life-changing journeys. More background info: Bremerhaven's may not be the biggest harbour in Germany (that's in Hamburg), but as far as the history of emigration goes, it was the even more significant one: some 7 million people in total sailed from Bremerhaven on emigration ships during the 19th and 20th centuries. Most went to the USA, but many also to South America, esp. Argentina and Australia. The museum, officially called "Deutsches Auswandererhaus" – 'German Emigration Center' – had long been in the making before it finally opened its doors in August 2005. Just two years later it won the European Museum of the Year Award – esp. in recognition of the emotional impact it delivers through a combination of large-scale reconstructions, multi-media and personalized stories. The location of the museum is authentic, right on the quayside that used to serve as an embarkation point for emigration ships. 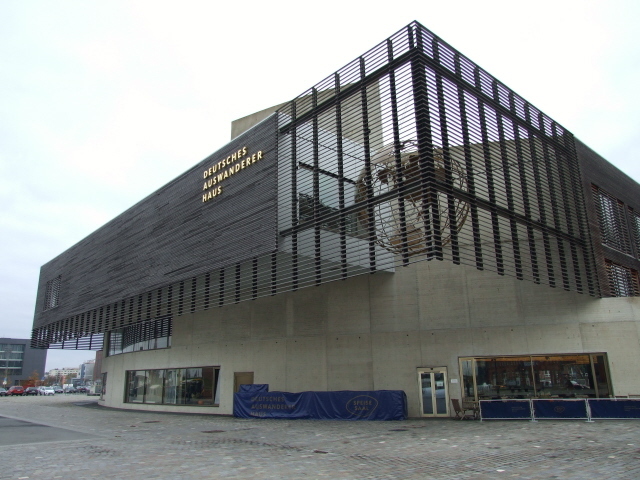 The building, however, is not; it's ultra-modern and was purpose-built for the museum. The German Emigration Center caters for a renewed interest in the (hi)story of emigration (or maybe it helped creating such renewed interest in the first place? 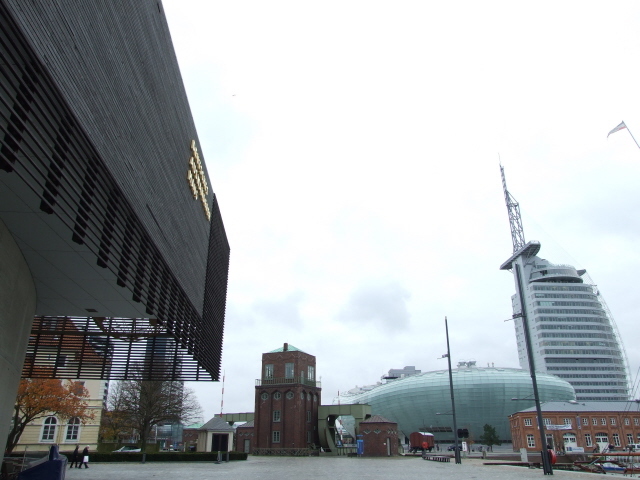 ), and forms an important component of Bremerhaven's waterfront ensemble of museums (see non-dark combinations). It thus also provides a boost for the city's economy, which otherwise suffers from high unemployment and all sorts of other problems. The latter hasn't given Bremerhaven the best of reputations as a city for tourists to visit – but I like it! In fact, I particularly like the contrast between this kind of faded, past-its-heyday "grottiness", together with its working harbour front, and the cluster of sleek ultra-modern museums which collectively are now known as the "Havenwelten" (which is word play on "Hafen", 'harbour', and "Welten", 'worlds' – but incorporating the older spelling of the former from the city's name). Until a few years ago there also used to be a particular vessel that would have been of special interest to the dark tourist: the Al-Zahraa ('the Rose') – an Iraqi ship that got kind-of "stranded" here in 1990/91 at the time of the first Gulf War against Saddam Hussein's Iraq. As it had been used for transporting tanks in the previous Iran-Iraq War, it suddenly fell under the newly imposed UN embargo. The ship had come to Bremerhaven for engine repairs – and with the engines removed it couldn't even have sailed again on its own if it had been allowed to. So it was just left there slowly rusting away. But the harbour fees were always transferred on time by Iraq and two Iraqi seamen remained on duty "guarding" the ship (even though there was nothing left to guard, really, other than rubbish and rust). From 2002, with the beginning of the next 'Gulf War', these two Iraqis were practically forgotten, and receiving no more pay from Iraq had to rely on donations from the local Bremerhaven population. And so this bizarre relic, together with its two "castaway" seamen, remained in limbo at its mooring in the Kaiserhafen. After 21 years, in July 2011, however, the ship was finally towed away – namely to Klaipeda in Lithuania to be broken up for scrap. But it remains in local memory as one of the most bizarre stories of naval history of Bremerhaven. What there is to see: Once you've parted with your money for admission you are given what they call a "boarding pass". In addition to your ticket this contains a plastic chip card ("iCard") with which you can access various interactive elements (mainly sound recordings) at many points in the exhibition. Make sure you get an English-language card at the entrance (if you need it) – as you won't get a language choice at those sound recording points later! By way of this iCard you are also allocated one particular name, stamped onto your ticket together with a crude image and key dates like date of birth and date of emigration. 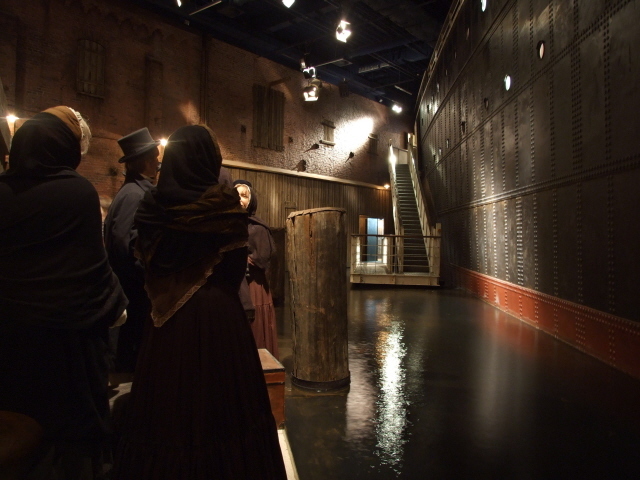 It'll be that real emigrant's personal story that you'll follow through the exhibition. The idea of "assuming an identity" is of course highly reminiscent of the same approach at Washington's US Holocaust Museum – here at the German Emigration Center it may be less controversial, but to me it still felt just a little "patronizingly" predetermined. I would have preferred the option of being able to compare different identities – or at least a choice of, say, what era "my" emigrant was from. (The story of "mine" was from around the 1880s, whereas my wife "had" one from the 1960s, which I may have found even more intriguing, partly because of my own family history, which has seen family members emigrate in the 1920s and 1950s respectively). I don't know whether it's possible to influence the choice, but if you too have certain preferences, it can't hurt asking at the reception desk when being handed your iCard … I only discovered the nature of the restriction when it was too late. Before you enter the exhibition proper, however, you have to be fed through a kind of entrance chamber with automatic doors. Inside an obligatory intro is played, in both German and English (very American English, by the way, making clear the expected majority of foreign visitors … with is of course in line with the statistics: 90% of German emigrants did indeed go to the USA). 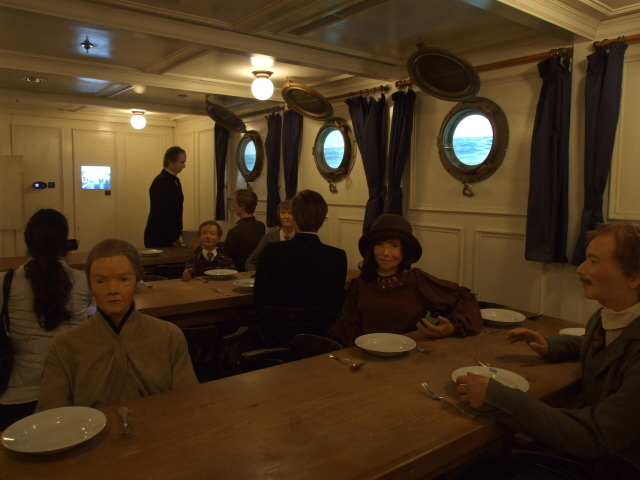 The chamber, incidentally, is a reconstruction of a waiting hall for third class passengers of the Norddeutsche Lloyd shipping company. Only when the intro's finished a door at the other side opens to let you into the main exhibition. Here you are free to proceed at whatever speed you wish – though the circuit is predetermined and pretty much chronologically organized (departure, embarkation, voyage, arrival, settling in the new world). Next you enter a kind of archives room, designed to look like something from the 19th century … here your iCard really comes into play for the first time: mainly by accessing audio files you can follow "your" emigrant's personal story and background (including his or her reasons for emigration). The focus here in genral is on the thoughts of the emigrants as they were waiting on the pier. Some paper files augment this too. Personally, I found it a bit too much info at this point – and I started assuming a rather selective approach here … but then again I was aware that I didn't have limitless time when I visited. I also have to admit that I found the particular "case history" I was allocated on my iCard a little boring after a while. But if you have all day (or at least four hours or so) and happen to have been handed a really interesting "identity", this may be quite different; then you could probably really immerse yourself in this aspect. The text panels and documents provided in paper form, by the way, are consistently in German and English, though in some cases the English appeared somewhat abridged. 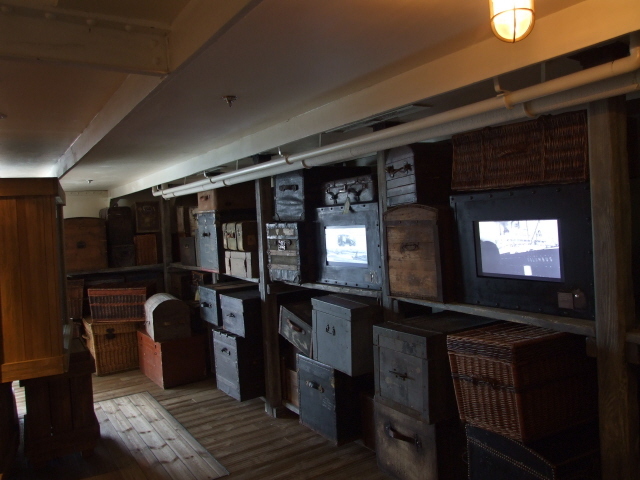 At the far end of the archives room you re-enter the harbour side ship mock-up installation, only now you find yourself on the gangway. 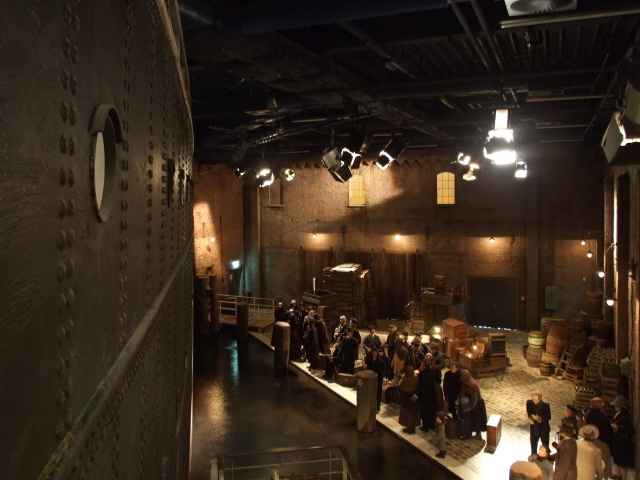 You proceed up the gangway along the side of the ship's hull and then "embark" on your journey to the New World on the emigration ship. I personally found the "onboard" section one of the best – not only for the informational content, but esp. for the "experience" factor. 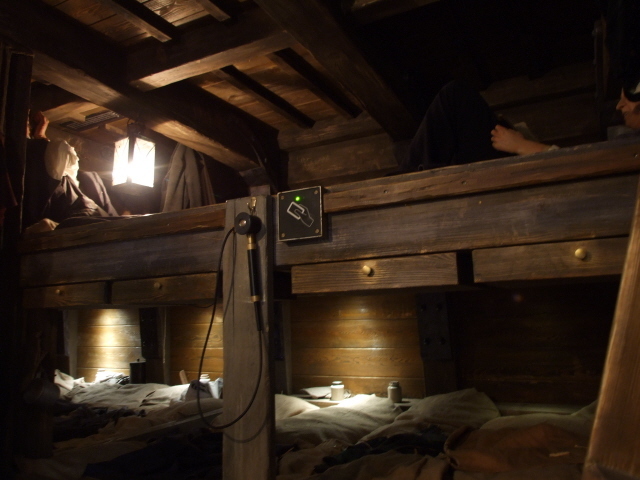 Not very lifelike dummies in bunk beds aside, you really get a feel for being on an emigration ship of ca. a hundred years ago. The only thing that was missing was moving floors to simulate the ship's progress through the ocean's waves. What they did do, though, is put little screens behind the bull-eye windows on which moving images of the sea enhance the simulation of "being at sea". The differences between third, second and first class are also demonstrated – although I found the food menus allegedly offered even to third-class passengers surprisingly lavish and varied! The next thematic section, not all that surprisingly, is that of arrival in the New World – in this case (like at Hamburg's BallinStadt) the choice of where exactly is the most obvious one: Ellis Island in New York, USA. First you pass through a long tiled corridor, where windows allow a blurred glance back onto the embarkation mock-up below. 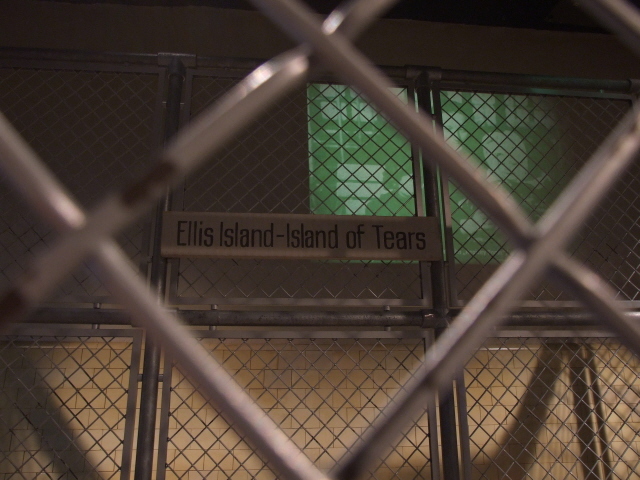 Then you enter a room with cage-like contraptions – the Ellis Island reception station. In here you can, again, sit on benches and listen to individual stories. At two interactive touch-screens at the back of the room you can then try your luck yourself: answer the questions of the "immigration inspector" and see whether you would have been allowed entry to the USA or not. I passed, my wife failed. But then again I already knew from having been to Hamburg's BallinStadt emigration museum which of the questions were trick questions and where you had to be careful. I thus didn't fall for the traps. Whereas my wife insisted in rebelliously, and untruthfully (! ), answering the question "are you an anarchist" by pressing "yes" – in contrast to that I tried lying more strategically, e.g. by withholding the fact that I have relatives in the USA, and so I managed to "con" my way through … (why the thing about relatives? – see under BallinStadt emigration museum). 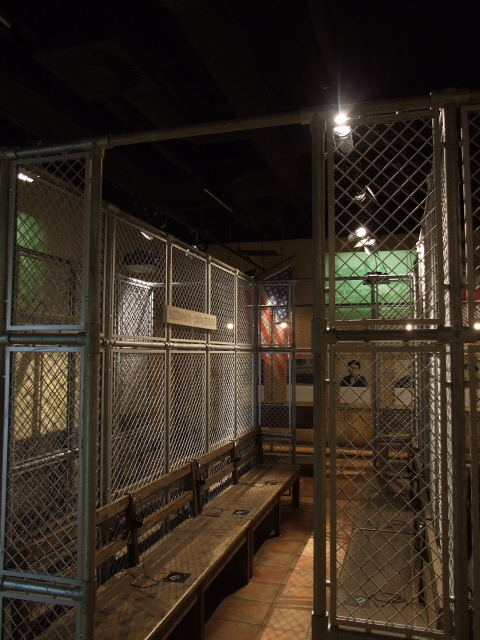 Following the Ellis Island part is a series of sections that have been remodelled and expanded in recent years when a completely new wing was added to the site. The first of these concentrates on the new life of emigrants in the various countries covered, mainly the USA, Argentina and now also Australia. Maps spell out place names in these emigration countries that either directly copy German names of cities and towns or include certain German allusions (like Alemania or Colonia Bismarck). The map for the USA is interactive and you can press buttons to punch up where in the US there are, say, Berlins or Hamburgs. Another interesting map shows how the various ancestor nationalities of immigrants to the US are distributed. According to that map, the US should be predominantly German! Only Maine, Vermont, Delaware and Utah bore the colour for English! The second and third largest groups were African and (in the south-west) Mexican. Then follows one of the new star pieces of the Emigration Center: the cavernous room that tries to be a representation of Grand Central Station in New York. It doesn't quite achieve the overwhelming impression the real thing gives you, but it's not bad. The topic here is, quite predictably, the continuation of the story of the new arrivals after Ellis Island, i.e. once they had entered the US and had to fend for themselves in their new life in a strange land. In the centre of the hall a group of dummies – a black station porter and a German mother and child – give an impression. The woman holds in her hand a kind of crib, a scrap of paper on which is written “train to Chicago” - only in funnily German spelling: “Trein tu Schiekago”. Then you cross over into the new wing – and this is no longer about emigration from Germany to the new world, but the other way round: immigration to Germany. (So the whole institution should have been re-named “migration centre”, really – but they just stuck with the established name for convenience, I guess). This section too is very visual and includes reconstructions of a kiosk (with typical German products of the time), a barber shop, a book shop and lots of 1950s furniture, design items and products. There are also a few panels that pick up contemporary issues of migration (e.g. should the children of immigrants in Germany be allowed to have dual citizenship?). 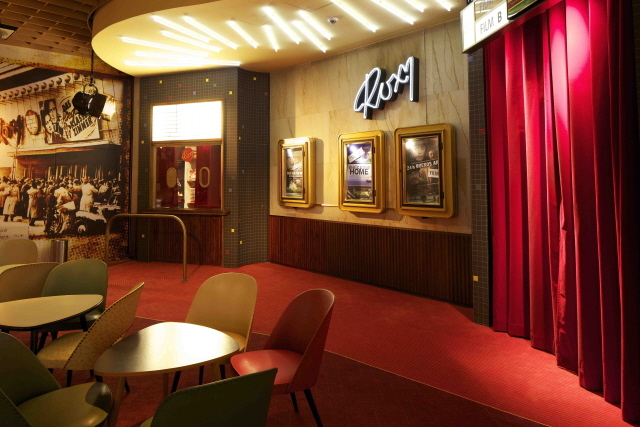 On the lower floor you get to the “Roxy Cinema” - again in a very 1950s-design-like facade and box office. The cinema does actually show films, though not 1950s kitsch but documentary films pertaining to the topic of im-/emigration. Three films are on show – one about Germans in the USA, one about Argentinians with German roots and a newer one about Australia. I only saw the first two of these. I found the film about Argentina especially captivating – and what's more, part of it is of specific interest to the dark tourist! One of the women appearing in the film, Betina Ruth Ehrenhaus, also told her story from the military junta years in Argentina, when she was arrested. 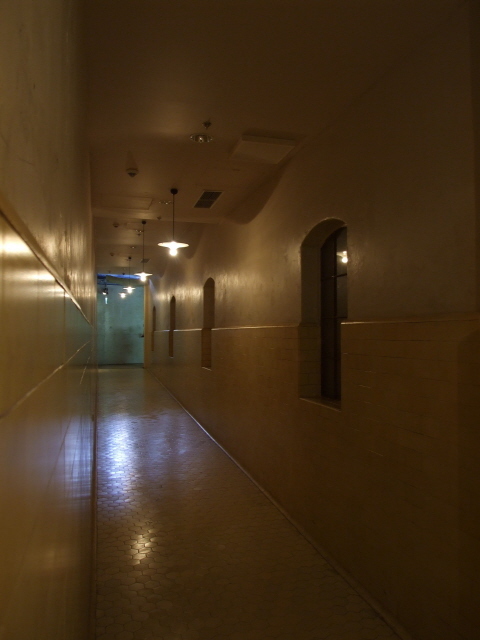 In the film she even takes the camera team through the ESMA memorial, a former detention centre for political prisoners in Buenos Aires. Not to be missed! 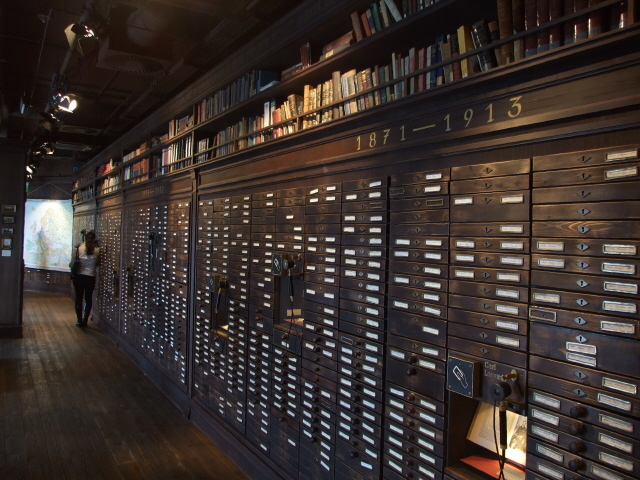 Back upstairs you could also pop into the genealogical research room. Here people can search databases for the fate of relatives who emigrated to the USA. I was there with my mother and we tried it out as she entered the names of members of her family who at different stages of the 20th century emigrated to the States, including her own older brother. We were indeed able to track down his early US documents as well as his death notice from just a few years ago. So if you have family ties like this, it can be a very moving experience. For more complicated searches you can also take advantage of the centre's staff who are on hand to assist. If you want to keep any of the finds you can pay for a print-out service (electronic copies do not seem to be an option). This basically concludes the museum visit then. En route to the exit you pass through the obligatory gift shop too – which in this case is particularly large and has various more or (often rather) less emigration-related and maritime items on sale. All in all, I found it a very enjoyable kind of museum – though not strictly speaking particularly dark, or only very occasionally so. 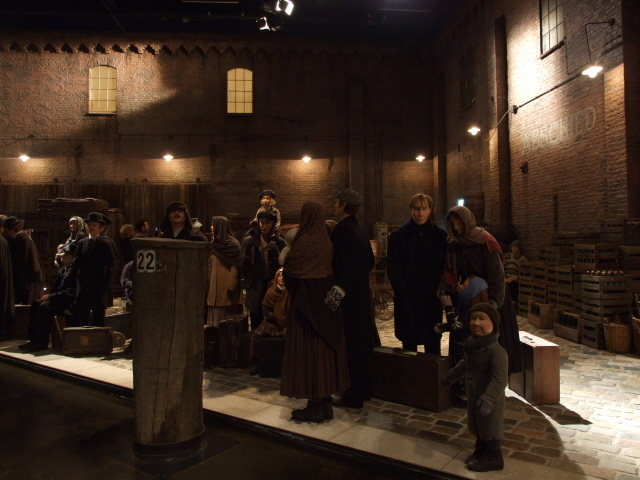 In that sense, the Hamburg equivalent, the BallinStadt emigration museum, offers slightly more (see the detailed comparison under its own entry here). But it's definitely worth going to the Bremerhaven emigration centre too when in the area. Recommended. Location: in north Germany, right in the middle of Bremerhaven's city centre harbour front at 65 Columbusstraße, just north of the other "Havenwelten" ('harbour worlds') museums and opposite the "Zoo am Meer" ('Zoo at the Sea'). Access and costs: centrally located in Bremerhaven, but remote from a general German perspective; not cheap. Details: To get to the German Emigration Center by car coming from (Hamburg and) Bremen on the (A1 and) A27 motorway(s), take exit No. 7 for "Bremerhaven Zentrum" and proceed on Grimsbystraße (No. 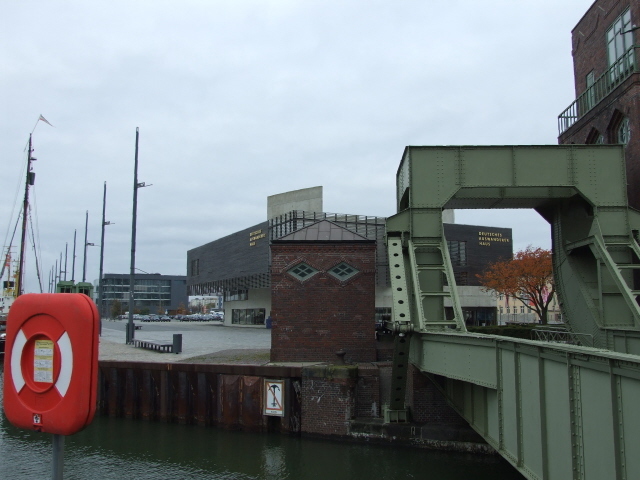 212) into the city centre and follow signs for "Havenwelten" and/or "Deutsches Auswandererhaus". You can either try and find a free parking spot in town and walk from there, or use the parking facility provided at the "Havenwelten", underneath the "Klimahaus Bremerhaven" (Address: H.-H-Meier-Straße 1, 27568 Bremerhaven; opening hours: daily 5 a.m. to 12 a.m., exit possible at all times; charges are by the the hour, with a maximum daily fee of 7 EUR). By public transport: buses 502, 505, 506, 508 and 509 all depart from Bremerhaven's central train station ("Hauptbahnhof") in the direction of the city centre ("Innenstadt"); get out at either the "Havenwelten" stop or "Bürgermeister-Smidt-Straße". Opening times: daily between 10 a.m. and 6 p.m. (in winter, November to February, only to 5 p.m.). Time required: on average, about three hours. You can rush through more quickly if you're selective, and especially if you don't want to listen to more than just a few samples of the countless recordings at the audio points. If you really want to take it all in, you could probably spend at least half a day in here (easily). 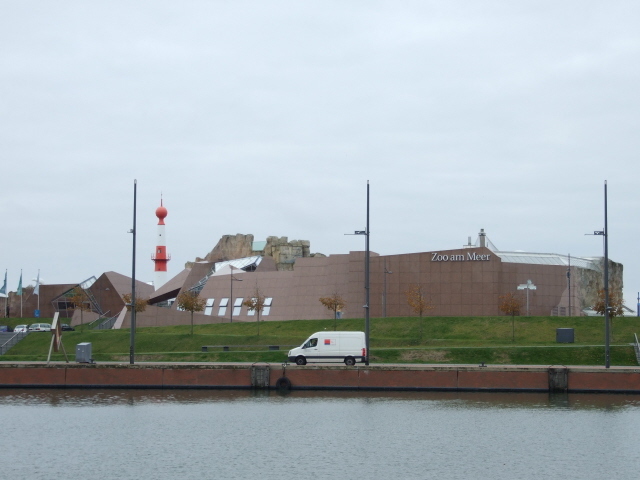 Combinations with other dark destinations: Cynics could claim that Bremerhaven as such is a kind-of dark destination (like a German equivalent of Bradford, Great Britain), but that's really just cynical. Bremerhaven may suffer from more deprivation compared to other West German cities, and it also lacks a proper city centre, but it does have its own rough-edged appeal. This is particularly true for the long, long harbour front away from the "Havenwelten" development. I for one love it. Especially the fact that you can still roam so relatively freely – which is something I grew up with (see why this interest), and which in my original hometown of Hamburg is near impossible these days (everything's fenced off and guarded and CCTV monitored there). Closer to the German Emigration Center, other bits of the "Havenwelten experience" complex may also have some appeal to the dark tourist, esp. 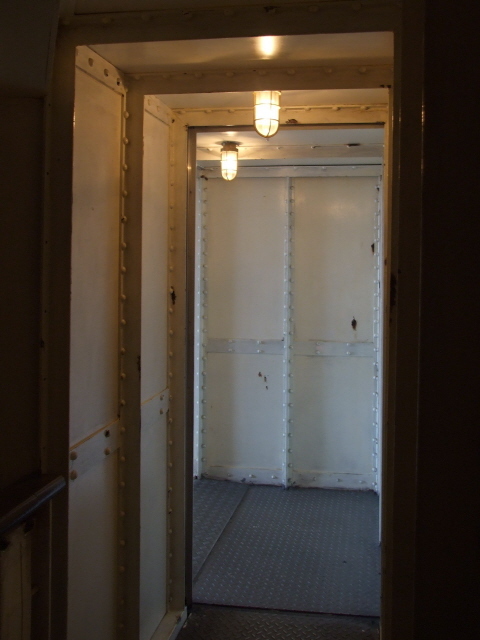 the Maritime Museum ("Deutsches Schiffahrtsmuseum"), and in particular the "Wilhelm Bauer" submarine that you can access the interior of … provided that you don't suffer from claustrophobia. Further afield, the Bunker Valentin, on the northern edge of Bremen constitutes the largest relic of Germany's darkest chapter in history, the Nazis' megalomania and WWII. In this case in the form of a gigantic submarine construction bunker, the largest bunker structure in the whole of Germany. The even darker sides of those times are commemorated at the sites of the former concentration camp Bergen Belsen and at the Sandbostel camp memorial. And of course Hamburg offers the most varied range of dark destinations in the north of Germany. Particularly noteworthy here is the main thematically linked attraction in Hamburg, namely that city's equivalent of an emigration museum, which is called BallinStadt – its own entry contains a comprehensive head-to-head comparison of the two places, which you can jump to directly by clicking here. Combinations with non-dark destinations: Generally, Bremerhaven may be a bit off the radar for most tourists. But its now highly developed "Havenwelten" ensemble of modern museums on the harbour front is beyond doubt a prime destination in its own right for any open-minded tourists travelling to northern Germany. At the very least it's a worthwhile add-on to stays in Hamburg or Bremen (from where it is only a short hop north). Apart from the German Emigration Center, there's the latest addition to the complex, the so-called "Klimahaus", 'house of climate', where visitors can experience various climatic zones of the world. It's housed in a particularly sleek modern edifice, which from the outside looks more like Bayern Munich's football stadium than like a museum …The "Deutsches Schiffahrtsmuseum", 'German National Maritime Museum', is the most established component of the ensemble of museums. The cutest part of the complex is the "Zoo am Meer" ('Zoo at the Sea'): given its severely limited amount of area space it may be one of the smallest zoos anywhere, but it uses that space in an admirable fashion. And you can see some really unusual animals here too (how often do you get to see gannets at a zoo, for instance! … or a colony of gay penguins!). One larger enclosure was added in more recent years for the stars of the zoo: polar bears. With a bit of luck you can even see them swimming – through large panels of re-enforced glass. There is also a new North Sea Aquarium now.